Having this in mind, you can control the behavior and enable/disable different parts of your grid view according to some internal logic of yours. GridViewDataColumn.IsEnabled property cannot be actually used. It is a dependency property inherited from ContentElement. You can disable whole column by changing the IsEnabled property of each one of its cells. This property gets or sets a value indicating whether this element is enabled in the user interface (UI). This is a dependency property inherited from UIElement. 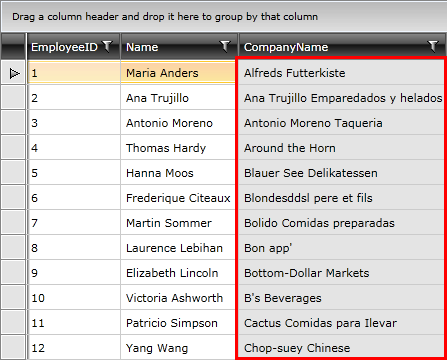 The screenshot below illustrates RadGridView control with a few disabled cells along with the "CompanyName" column. To disable all the rows you need to apply a Style targeting the GridViewRow element. The defined Style is implicit and it will be applied to all elements of type GridViewRow. To apply the disabled style to some rows only, you can consider RowStyleSelector.